Today I am thinking about all the men and women who serve in the U.S. Armed Forces, and especially about those who have lost their lives during their tour of service. I am one of the lucky ones. My immediate family has not suffered the loss of loved one to a war. Other families have not been so blessed. And even if their soldier came home, many families have lost the life-they-once-had with their soldier because of the toll of his/her service. My husband and I took a trip thru Normandy a few years back, and seeing the loss of so many young lives firsthand was very moving, and at times overwhelming. Thank you, to all the men and women who have served and sacrificed for our country. Thank you to their families who sacrificed as well. Lots of fabric stores (Mood, Fabric.com, Elliott Berman Textiles, etc) are having Independence Day sales, including our local Pacific Fabrics with 20% off all fabric. Celebrate our freedom by buying more fabric? Well, happy birthday America, and celebrate however you see fit, fellow sewists! Not fabric this time, but notions and supplies. As a teacher, I can really churn thru thread, Steam-a-Seam, and iron cleaner working with students. 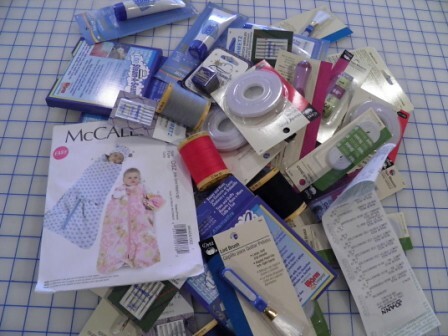 I made a brief stop at my least-favorite sewing store yesterday to stock up during their 60% off notions. The best part of the trip was running into one of my ASG sewing sisters, and the second best part was saving more money than I spent. Weirdly cool, right? Some of you might say ANY weather is sewing weather, but some of us Seattle-ites like to take advantage of every sunny moment to get outside. Do you check the weather forecast to decide which days or time of day you sew? I do! I can’t always time it perfectly, but I at least consider weather when planning my sewing week. SewMaris: Mr. Weather, what made you first get interested in weather? Mr. Weather: I worked in chemical sales for nearly 40 years, and I flew around the country on a weekly basis. Since I traveled so much, I was always interested in what the weather was going to be like at my destinations. SewMaris: I didn’t even know a regular type citizen could evenbuy a weather station! I thought they were only for TV and radio stations. Mr. Weather: No, not at all. You can buy a very basic station that just gives you the the temperature and wind speed, and that was the first kind of weather station I had when we lived in Illinois. Then in 2010 my wife bought me a new system which is WAY cooler, very small (see pix above! ), and transmits all the data wirelessly directly to my computer. SewMaris: Wow. Too cool! What do you like most about weather and your station? SewMaris: Well, what’s next for the Mr. 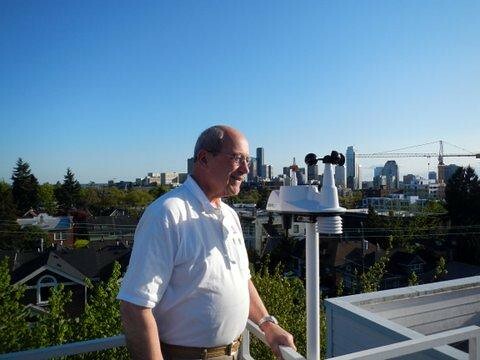 Weather station on Capital Hill? Mr. Weather: The next step is to add an outdoor webcam, and then a live webcam. That will be REALLY cool! There you have it, dear readers. Mr. Weather is as geeky about weather as I am about sewing. And I check his update every day while drinking my morning coffee. From one geek to another, thanks for sharing, Mr. Weather! I really don’t care a whit who gets the Oscar for any category most years, but I do like watching the red carpet. This year I even managed to get a huge load of ironing done while viewing – bonus! My favorite look for the evening was Penelope Cruz. I thought she completely captured the iconic elegance of Grace Kelly, and I loved, loved, loved her ensemble. A close second favorite was Tina Fey. A girl after my own heart (often seen in black), I thought her custom Carolina Herrera black peplum gown was another stunner. Though I am not sure anything will ever top the short black lace Oscar de la Renta dress she wore to the Mark Twain award ceremony in my book….just saying. What did you think? Any new favorites last night? I probably should have been sewing instead of viewing, but I am going to finish those jeans I never entered into the PatternReview contest TODAY. I will! Advancing sewing as an art and life skill…. There are so many great benefits to belonging to ASG. I have met some of my favorite people thru this organization, taken classes sponsored by my chapter and others nearby, improved my sewing skills by quantum leaps, and enjoyed endless camraderie and laughter with my sewing sisters. And there is some goodness-mojo too. Every year a new charitable project is selected by the national organization, and members spend many hours each year sewing for good causes. 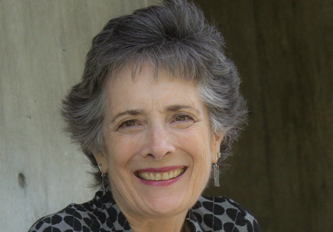 In addition, individual chapters, neighborhood groups, or individuals can (and do!) contribute their time and creativity to any needy organizations that they have a heart for. Anyone who loves to sew is welcome as an ASG member, and if you haven’t joined yet, I hope you will soon. Ooops! I better sign off. I need to finish packing for my annual fall retreat with my sewing sisters. Wish you were coming along! I make cool stuff with pretty fabric. I continually grow and improve my skills. I get pleasure from wearing things I have made with my own two hands, and seeing my friends and family enjoy and use things I have made. I practice patience and perseverance working on complex projects (and sometimes I practice creative language skills too 🙂 ). 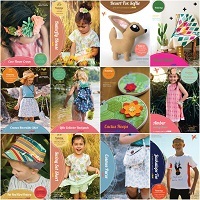 I feel connected to a larger community of sewists, including my mom, grandmothers, aunts, and many, many good friends. I love the art and craft of sewing. I just plain love it, and it is one of the few things I want to do it nearly every day. 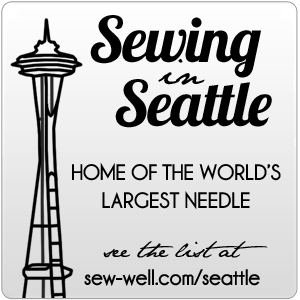 National Sewing Month is sponsored by the Sewing Craft Alliance, in partnership with the American Sewing Guild. As part of the fun, they are also sponsoring a sewing contest. How fun is that? All you have to do is submit pictures of your project no later than September 30, 2011, and include a ♥ in a visible location. What do you think? A fun challenge, or too much stress?